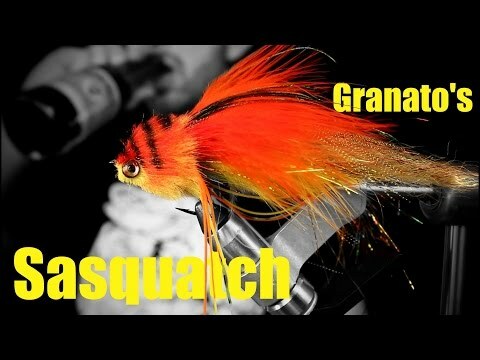 Brian Wise takes one a great streamer pattern, Nick Granato’s Sasquatch. Nick is know from some awesome large streamers and did a full Sasquatch tutorial in the 2011 issue of Hatches (see more of Nick’s flies HERE) and Brian is cranking out some of the best fly tying videos today (see more HERE)… so they are a perfect match. Head – Craft Fur Dubbing Brush colored with markers. Mate I am in Australia and setting up a site for Au fishing. That streamer is awesome and if you can let me know how much I want some. Not only to sell on tacklebay but to try myself. Green and Gold is our country colours however as most lure and fly fishers know, it is a great combo for lures. Let me know and don’t worry about the knocker, I don’t see him having a go. Keep up the good work mate.